Cake: Preheat over to 350 degrees. Cream butter and sugar. Add eggs and mix well. Add milk and mix well. Add flour and baking powder; mix well. Finally, add Mexican vanilla and mix well. Grease & flour two 9 inch round cake pans. Bake for 30 to 35 minutes. Cool on wire racks. Syrup: While cake is baking, combine sugar and water in a medium saucepan. Heat until syrup-y, then add lemon; allow to cool. Place one cake on a cake platter and prick holes in it with a fork. 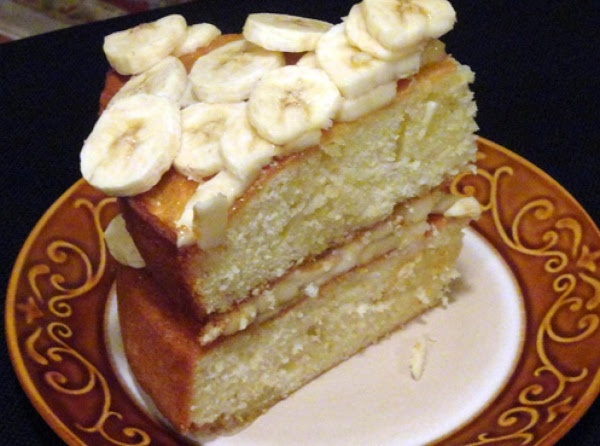 Place half of the sliced bananas on 1st layer & pour 1/2 of syrup over the bananas and cake. Place 2nd cake layer on top of the 1st. Prick holes, layer bananas, then use the last of the syrup. Keep in the refrigerator... as it will last longer and stay moist. Remember, this recipe is over a 100 years old. Makes me wonder how they kept it fresh back then!